Finally, a television documentary to counter the Hysteria Channel’s constant refrain of Doom, Death, and Destruction about 2012! Respected filmmaker Graham Townsley (NOVA, National Geographic) has just inked a contract to produce a three-part documentary film about the Maya and 2012. How do I know this? I am delighted to report that he has asked me, Yr Obt Svt, to appear and provide expertise in the first segment, which will focus on the Ancient Maya and what they actually tell us about their view of the upcoming “End of the Calendar”. As I write this, Graham is readying his crew to depart to Chichén Itzá, where he will film the popular Equinox festivities there (for a different segment, about modern beliefs about the Maya Calendar). The modern idea that the Maya Calendar “ends” on 21st December 2012 derives entirely from a single peculiar fact. The Maya counted Time (in days) from a fixed point far in the ancient past, just as we count years from the Birth of Christ (supposedly; our calculations are actually off by a few years… Jesus was actually born sometime in 4 – 6 BC, which when you think about it, is a self-contradiction worthy of an Isaac Asimov story). We call this calendar the “Long Count”. They have been counting up for some 5,125 years, and by all rights, their “Day Zero” (also called “Era Day”) should be numbered 0.0.0.0.0. But, noooooo, they called it 13.0.0.0.0, after which, like a clock at midnight, the Calendar reset to 0.0.0.0.1 (or perhaps, again like a midnight clock, 13.0.0.0.1), which preceded the era 1.0.0.0.0, followed by 2.0.0.0.0, and so forth. This implies an even *earlier* Era date 5125 years or so *farther* back in the past, and maybe another, and another… But unfortunately the Maya record is entirely silent —so far— about what might have happened, calendar-wise, in 8239 BC. The Maya penchant for dating *all* events, even mythological ones, provides us with some entertaining reading. Around the last Era Day the Three Palenque Patron Gods performed some peculiarly godly acts: One of these, whom Linda Schele nicknamed “Lady Beastie”, gave birth at the tender age of 754 years…. As I write this (on Thursday 10th March 2011), the Maya Long Count date is 12.19.18.3.8, with a “Calendar Round” of 2 Lamat 1 Kumk’u. In late December 2012, we will arrive again at 13.0.0.0.0. I guess we will know soon if this ushers in a New Age or not. I prophesy a rancorous American presidential campaign and even higher gasoline prices. I should also remind y’all that this website comprises a rough draft of my vastly improved book, “2012: Science and Prophecy of the Ancient Maya”. In the book you will find a much-improved and -expanded examination of the cloud of issues surrounding this popular meme. 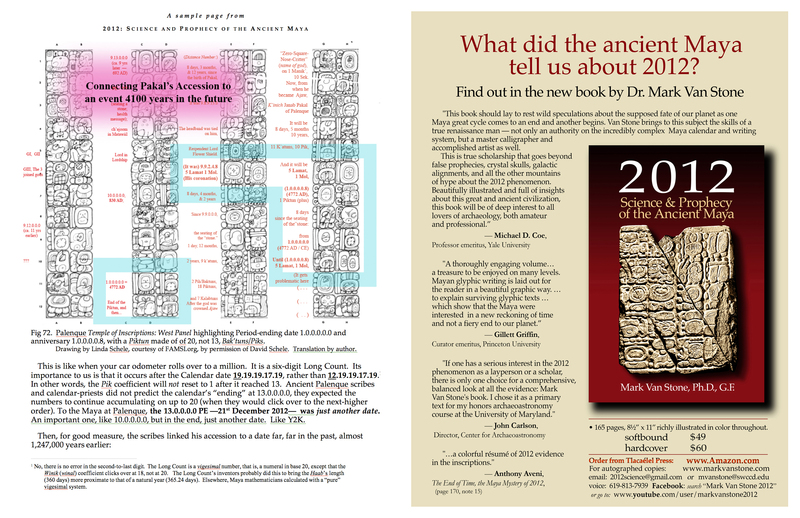 There are now over 1000 books published about the Maya 2012 phenomenon, and only three or four even attempt to be scientific, or faithful to what the Maya themselves believed. Mine is the only one of the lot in full color, the only one that might be termed an art-book.